The cyclone will recurve northeastwards towards Myanmar coast after which it will weaken gradually during January 7 and 8, said IMD. Cyclone ‘Pabuk’ over Andaman Sea and neighbourhood moved NNWwards with speed 15 kmph during past 06 hrs. Photo Credit: India Met. Dept. Twitter handle. 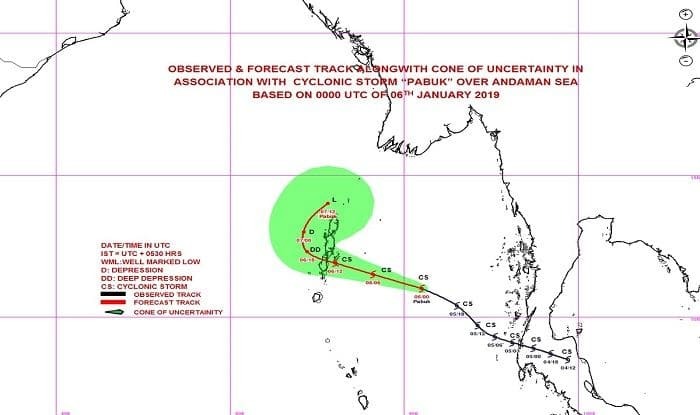 New Delhi: India Meteorological Department issued an ‘orange message’ warning for the Andaman Islands on Sunday in view of cyclone Pabuk, stated news agency ANI. The cyclonic storm ‘Pabuk’ over Andaman Sea and neighbourhood moved north-northwestwards with a speed of 20 kmph during the past 6 hours, stated an IMD bulletin. Since morning, several parts of the islands have been witnessing heavy rainfall, following which all the inter-island ships have been cancelled. Two teams of National Disaster Response Force have been deployed to avoid untoward situation. IMD: Cyclone warning(orange message) issued for the Andaman Islands. The cyclonic storm ‘PABUK’ over Andaman Sea & neighbourhood moved north-northwestwards with a speed of 20 kmph during past 6 hours. Cyclone Pabuk is very likely to continue to move north-northwestwards and cross Andaman Islands by Sunday night as a Cyclonic Storm with a wind speed of 65-75 kmph gusting to 85 kmph, stated the bulletin. A warning was issued by the IMD of the damage that the storm could cause to the thatched huts and power and communication lines as it passes the region. People on the Andaman Islands were asked to move to safer places and suspend all the fishing operations in the Andaman Sea and southeast and east-central Bay of Bengal from January 5 to January 7 and over east central and adjoining southeast Bay of Bengal on January 8. Pabuk, a once in the three-decades weather system, originated over the Gulf of Thailand made landfall on Friday afternoon in Nakhon Si Thammarat province.